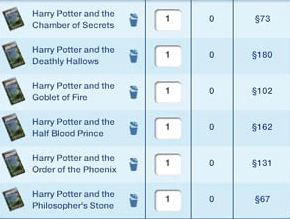 Add a touch of magic to your game and bring the world of the critically-acclaimed Harry Potter books into The Sims! NOT COMPATIBLE WITH 1.42/SEASONS. WILL BE FIXED SOON. 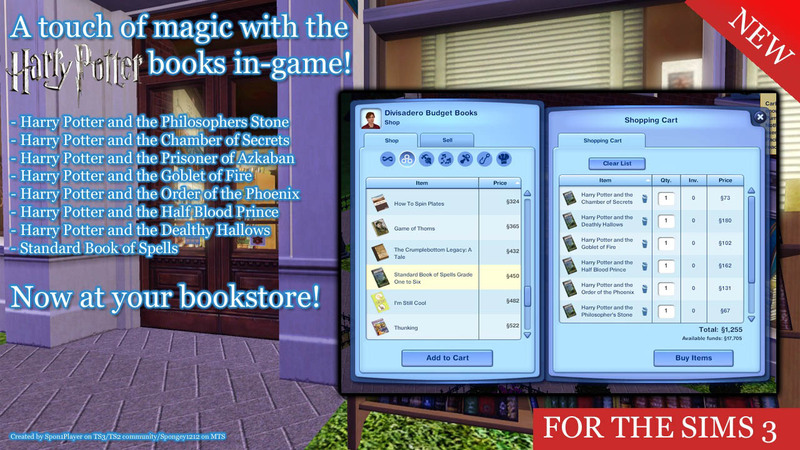 This mod brings all of the Harry Potter books into your game - making them available to purchase at the bookstore in-game. All of the Harry Potter books and an extra for fans of the series, the Standard Book of Spells Grades One to Six with 1000 pages of magic and wonder for your Sims brains to absorb. This is my first attempt at making a "mod" so I chose my favourite movie and book franchise and managed to get it going in the end, and hopefully you'll enjoy letting your Sims read the best book franchise! This mod is compatible with the base game and runs with patch 1.38. Update (22nd September 2012): New version available! The updated version of this mod fixes problems where all books would disappear with Supernatural/Version 1.38, removes The Standard Books of Spells (for now), and makes the book pages the actual amount as in real life. Happy Reading! Update (28th September 2012): Works with 1.39! This works with 1.39 as I can see, which was released to fix the zombie spawning problems in Supernatural. This mod overrides the Books _XML in GameplayData and will conflict with every mod that does the same. HPBooks_V2.zip | Description: New version. Fixes errors with 1.38.